In the SuiteFiles web app (in the browser) you can create a new file using the file template function to either create a copy of a file, or create a copy of a file and populate it with a clients information from the Xero apps. While located in the folder you wish to create the new file in, click the blue create button on the right-hand side of the web app and click "file from template"
This will open a window where you can select the file template you wish to use, clicking on a template category at the left hand side will display the templates assigned to that category, the search field at the top-right can used to enter keywords and do a search through your file templates. The text field with a red outline in the screencap above is for the name of the new file while the text field with a blue outline as above is for entering the client name then selecting the client to use for the file population (Leave this blank if you don't want to populate the file). If you'd like to create the new file from the template you have selected, simply click the create button and your new file will be created and opened for editing. When entering your own Field Values, you can either overwrite fields which already have information in them, or if they're blank you can enter your own information to populate those merge fields with. The above screenshot shows the window for entering your own data for merge fields to populate with, after entering any data you can click the create button to finish creating the new file. If no text field to select a client is available then there's currently no active integration with any Xero apps to retrieve the clients. 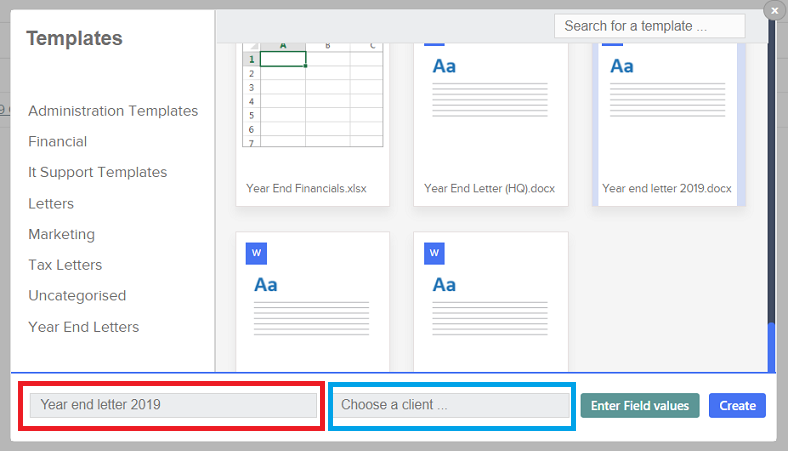 If you're in a client folder with the structure "Clients/ClientName" even if you're in a subfolder under this structure, it will attempt to find a client with the same name from your Xero Client List and will automatically select this client.